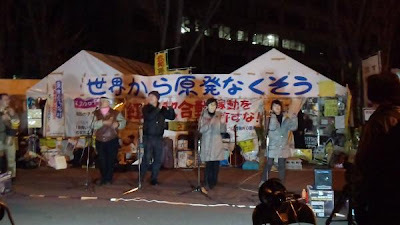 Outraged citizens gathered around the tents of no nukes activists in front of the Ministry of Economy, Trade and Industry in the evening of January 27. 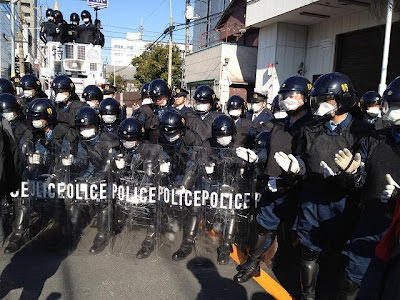 As the 5 p.m. deadline the economy minister Yukio Edano set in his order for clearing the tents approached, the crowd grew rapidly and the area was soon packed with protesters and those from media and police. The number of protesters increased continuously and eventually reached 750. Another ten thousand viewed the scene through webcast. Thanks partly to the media exposure, the eviction crisis was turned into an opportunity for no nukes activists to make the tents better known to the general public. 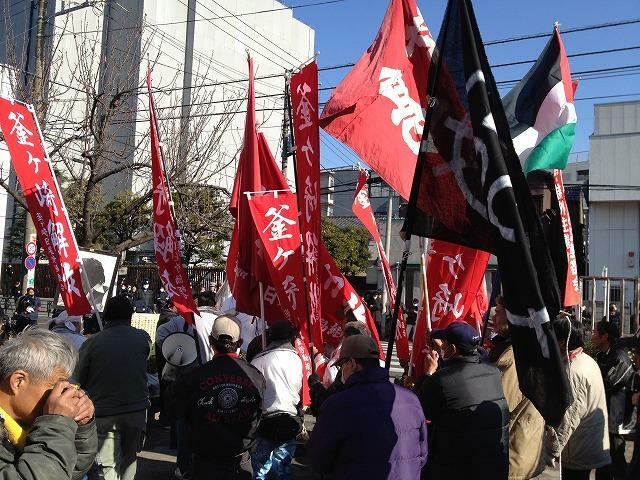 Nakama Union's Demonstration against Hashimoto's 'Reform': "It will only impoverish Osaka as a whole!" 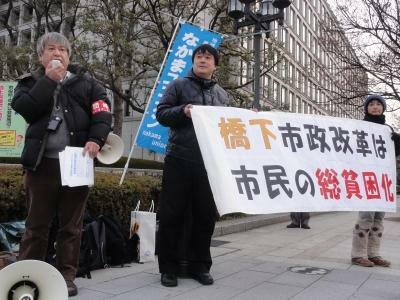 Members of two chapters of Nakama Union in Osaka held a demonstration in front of the city hall on January 25 to protest against a series of aggressive changes that the mayor Toru Hashimoto has hastily been introducing under the name of a political reform. (Photo) Municipal employees and public school teachers belonging to the union chapters appealed in the flyer they distributed during the demonstration that Hashimoto's 'reform' lead to a full-scale impoverishment of the population of the city. The flyer reads, "Mayor Hashimoto attempts to slash the social welfare budgets. Though it is true that increasing subsidies including welfare benefits are heavily pressing the municipal finance, it is a result of the national policy for which the municipal government cannot be blamed. The main cause of the wide-spread poverty is the deregulation regarding non-regular employment that the national government promoted in response to the request by business and industry. In order to alleviate the problem, the mayor should demand the national government to take measures including additional allocation of financial resources. However, he is opting for a massive reduction in welfare budgets instead, starting with the pay-cuts for municipal workers that are of an unbearable level. We strongly oppose to the policy of Mayor Hashimoto." On January 18, the Nuclear and Industrial Safety Agency presented to the panel of nuclear experts the draft report on the results of stress test on reactors No. 3 and 4 of Kansai Electric Power Co.'s Oi power plant that concludes the idled reactors are safe enough to restart. The panel meeting was closed to the public: Citizens were unable to observe it directly nor on a monitor in a separate room. NISA violated rule of democracy by denying citizens' right for transparency on such a critical issue like this. 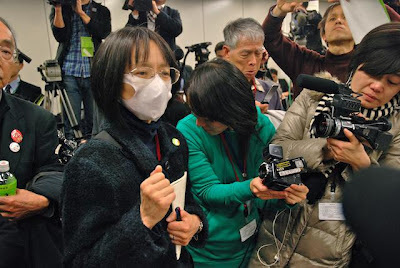 Two of the experts, Dr. Hiromitsu Ino and Dr. Masashi Goto refused to leave the original room, maintaining that the discussions should be open to public. The meeting was held without their participation. The discussion of the panel meeting held under such abnormal circumstances could not have been exhaustive. In view of citizens, the meeting was deviated from a due process. 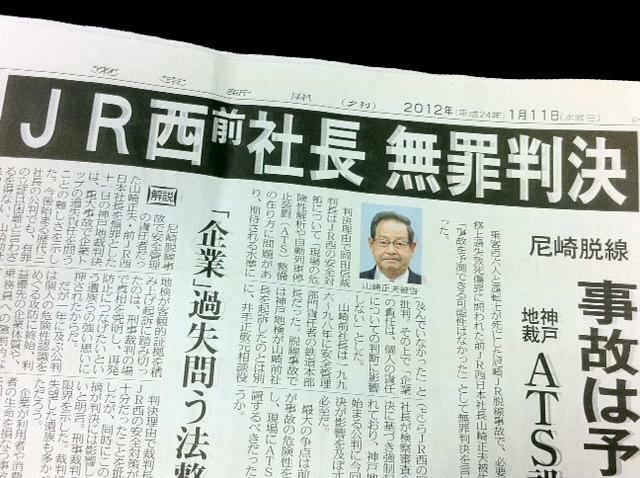 The writer of this article went into the meeting room a little after 4 p.m. with a person from Koriyama, Fukushima. Instead of going to the monitor room on the tenth floor, we headed straight to the eleventh floor where the meeting was held. There were about twenty citizens in the meeting room including Mr. Koji Sugihara of the Emergency Action on the Fukushima Nuclear Crisis. We entered the meeting room smoothly. So did the others. The TV reports of 'forceful invasion in the meeting room by activists' were what they fabricated. 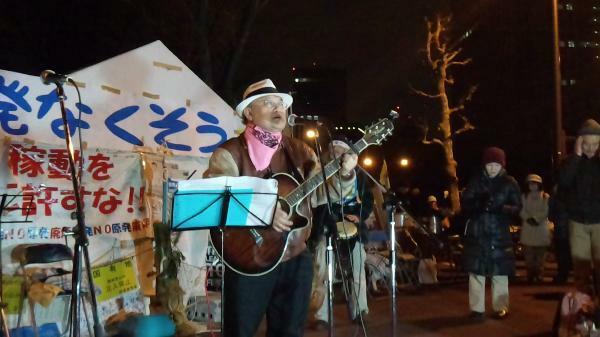 Video (Actor/Activist Taro Yamamoto); Photo Report by Seiichiro Nishinaka; Video (OurPlanet-TV）Photo: a female protester from Fukushima saying "Tepco executives and MEIT officials never understand how much we suffer!" 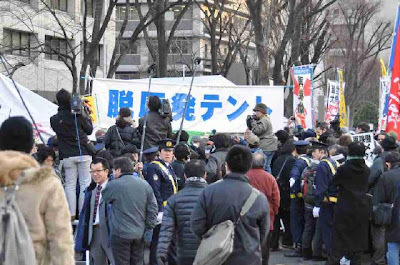 The supreme court gave rulings on January 16 on three lawsuits filed by a total of 166 public school teachers who refused to stand and sing Kimigayo anthem at schools events. The court annulled suspensions and pay-cuts regarding two plaintiffs acknowledging that such punishments by Tokyo Metropolitan Education Board were excessive. However, the reprimands given to other 163 plaintiffs were endorsed. 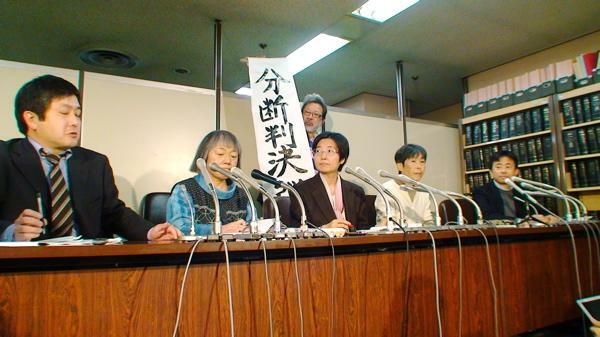 While some appreciate the court's decision on the account that it will control the education board's moves to some extent, many find it unsatisfactory because the suspension was not annulled in the case of Ms. Kimiko Nezu, the icon of Kimigayo lawsuits. Both the plaintiff herself and the supporters were puzzled at first, but they came to understand what happened as they closely examined the verdict: The record of suspensions prior to the present case, including the one for ripping of Hinomaru flag, was mentioned. 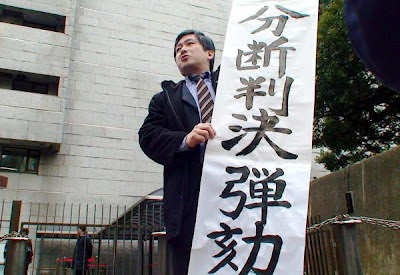 Mr. Makoto Iwai, the layer representing Ms. Nezu, severely criticized the court in the debriefing session. "The verdict shows the strong feeling of disgust the judges have against Ms. Nezu. They are determined not to tolerate those who disturb the order. It will impose enormous pressure on public schools." While the court mildly warned the education board, it relentlessly ruled out the plea of Ms. Nezu most probably to intimidate those may follow her suit. 1. I’m a worker with one-year contract. I’m dispatched to do accounting at a company that has a business contract with its headquarters. I was promised for a lifetime employment (until retirement at 60) but was informed my contract will end in March because the headquarters merged with another company. 2. I’m a casual worker. My contract is renewed every six months and is good for four years. The contract is renewed in December, but my company told me that it will terminate my contract in November due to shrinking business. Is this fair? 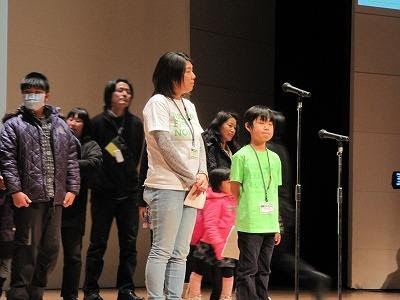 “We will extend our support to the victims of Fukushima disaster with international solidarity,” said Tatsuya Yoshioka, who led the conference committee. “And we will successfully shift from nuclear energy to renewable energy.” Former Fukushima governor, Eisaku Sato, pointed out that nothing was realized out of five principles agreed in the international conference 20 years ago after the nuclear disaster in Chernobyl. 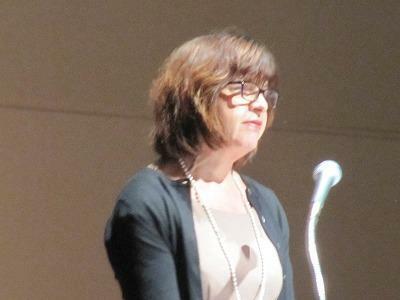 Rebecca Helms (photo), EU parliamentarian, talked about how Germany suspended four plants immediately after the Fukushima disaster but suffered no shortage of electricity for eight months since. 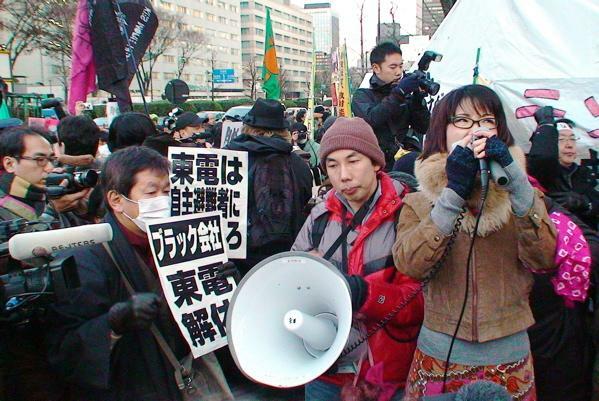 She added that the Japanese government should learn from other countries and overseas experts on behalf of the victims in Fukushima. (By T.M.) See photos. 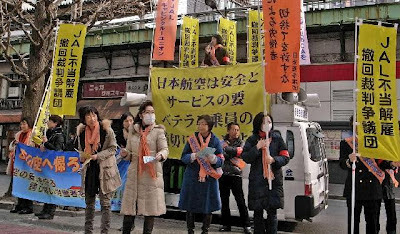 Day laborers, who most often end up working to settle Fukushima disaster and in the highly contaminated environment, gathered at a park in Tokyo’s Taito Ward on Jan. 9. 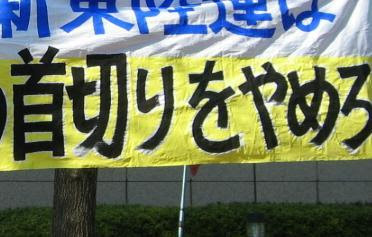 In demand for jobs, some 200 workers came together from Shibuya, Tama and other districts of Tokyo, Yokohama, Nagoya and Osaka. 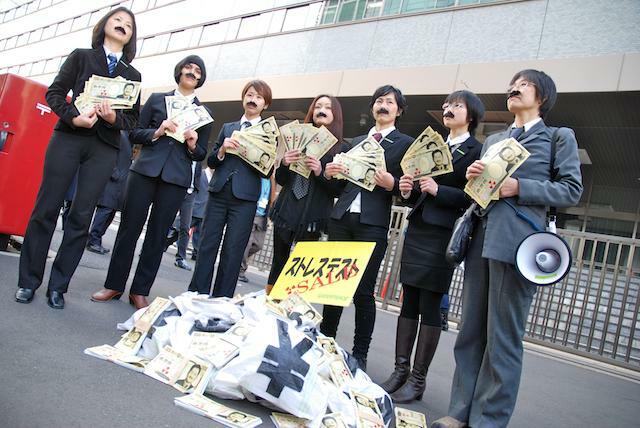 “No one wants to work at nuclear plants,” said one of the members from All Japan Coalition of Day Laborers (Hiyatoi Rodosha Zenkoku Kyogikai) “Everyone who is working at nuclear plants have no choice but to risk their lives.” The annual rally held since 1980s is a tribute to the two video activists who were killed by an organized crime syndicate. The movie, “Yama, Yararetara Yarikaese,” depicts a serious conflict between day laborers and job distributors. (By Chie Matsumoto) Photo: Riot police are mysteriously wearing face masks.